The X-Men are a Marvel Comics superhero team. The X-Men were created by writer Stan Lee and artist/co-writer Jack Kirby, and the original and foundation characters first appeared in The X-Men #1 (cover dated: September 1963). Those characters are Angel, Beast, Cyclops, Iceman, and Marvel Girl (Jean Grey) – the X-Men; and their leader, Professor X and their primary adversary, Magneto. The X-Men and Professor X are mutants, a subspecies of humans who are born with superhuman abilities. The X-Men fight for peace and equality between normal humans and mutants in a world where anti-mutant bigotry is fierce and widespread. Magneto and those later allied with him fight to conquer humans so that they can rule over them. One could say that after 54 years, the X-Men have a fictional history and mythology that is quite convoluted. However, the X-Men's knotty and tangled state of affairs has less to do with the passage of time and more to do with editorial, publishing, and business decisions regarding the X-Men franchise and line of comic book publications. Enter cartoonist Ed Piskor. He is best known for his long running webcomic, Hip Hop Family Tree, through which Piskor chronicles and traces the Byzantine origins and development of rap and hip hop music and Hip Hop culture. Fantagraphics Books has successfully collected the webcomic into print via graphic album collections and a comic book series. X-Men: Grand Design #1 opens on The Watcher, the classic Marvel character that observes and records events. One of many, this particular Watcher watches Earth. His focus is currently on the mutants of Earth, primarily observing the activities of one Charles Xavier, a mutant who will gather a team of mutants that he will name, “The X-Men.” Together, Xavier a.k.a. “Professor X” and his X-Men will change the world. But first, Prof. X will have to gather just the right kind of mutants who can become just the students he needs. Meanwhile, other players, mutants and otherwise, have their own plans for the mutants of Earth. THE LOWDOWN: The first 30 years of X-Men comics begins in 1963 and ends in 1993. Most of the comics that Piskor references for X-Men: Grand Design #1 were published in that time span, but several were published after 1993, including some that were published in the twenty-first century (a.k.a. “the 2000s”). Thus, it can be said that X-Men: Grand Design provides a condensed history that it also a detailed list of specific big and consequential moments in X-Men history. So is X-Men: Grand Design #1 a good comic book, and the answer is yes, but not specifically because it is an X-Men history. In fact, Marvel Comics has produced X-Men comic books like this in the past, the best being X-Men #138 (cover dated: October 1980), a poignant coda to the “The Dark Phoenix Saga” by the legendary X-Men creative team of Chris Claremont and John Byrne. 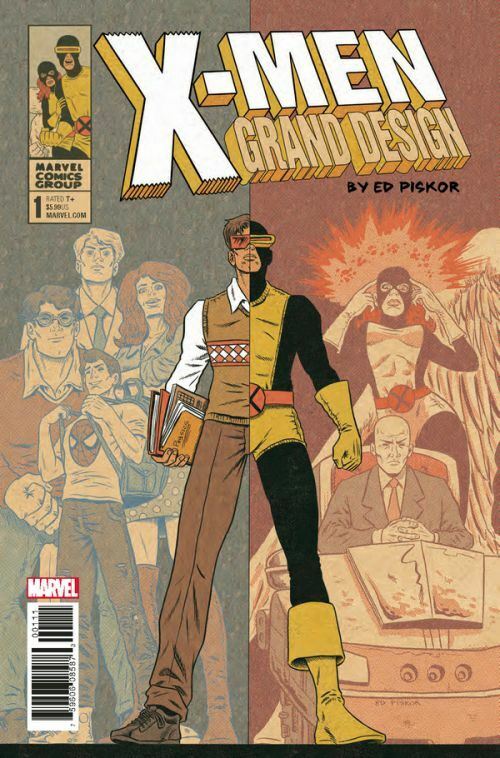 X-Men: Grand Design #1 works because of Ed Piskor's aesthetic. As writer, illustrator, colorist, and letterer, Piskor has created a unique graphical style that recalls comic books of the 1960s and 1970s. Piskor produces comic books that are a visual, graphics package that is a “hands-on creation.” Without the help of computers, comic books were once produced by people who used their hands, knowledge, training, and skills to draw, color, letter, cut, copy, paste, and measure in order to produce a physical package that was then sent to the printer to be turned into a physical comics publication. That “old-timey” quality and Piskor's ability to create large, condensed histories without sacrificing the details of the stories is what makes X-Men: Grand Design #1 a grand comic book. So it does not matter that this is about the X-Men. It could be Avengers: Grand Design, Spider-Man: Grand Design or even “Grand Designs” about Superman and Batman; the attraction would still be Piskor. Because Piskor loves comic books so much, it shows in his fantastic comics. I READS YOU RECOMMENDS: X-Men fans and X-Men fans-curious will want to read X-Men: Grand Design.